academics, and Western environmental news reporters. 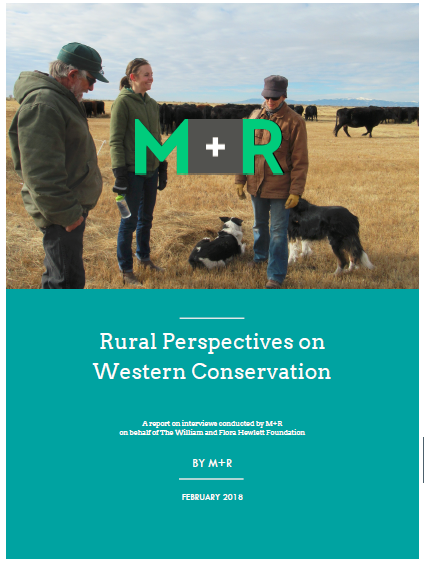 The foundation sought to understand attributes of successful conservation efforts from a rural Western perspective, and what commonalities exist among and across Western communities that advocates can learn from and apply to future efforts. The report’s findings provide a snapshot of the current economic and social landscape of the rural West and possible implications for conservation. The interviews also yielded insights into the motivations and aspirations of individuals in the rural West that indicate both surprising as well as common sense best practices on how to engage and communicate with these communities. This is the picture that 39 Western advocates, academics, and landowners painted of the North American West as part of an interview process conducted by M+R on behalf of the William and Flora Hewlett Foundation from September-December 2017.